The 14th Territorial Legislature convened at a time of significant historical consequence for the U.S. and the world. The nation's workers were finally beginning to find employment at the end of the Great Depression and Nazi Germany had recently begun overt aggression toward its neighbors. With communist Russia and imperialist Japan also becoming increasingly aggressive and expansionist, the construction of Fort Richardson and Elmendorf Air Force Base began. Both would soon become vitally important in U.S. national defense and remain so through much of the remainder of the 20th century. 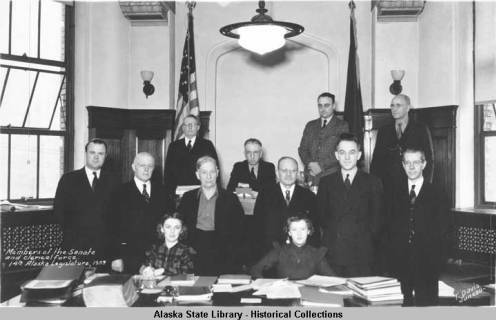 In Alaska, the Legislature focused on issues one might expect a growing Territory to face. Significant appropriations were made for school construction, roads, airports and other infrastructure projects. Among these was $10,000 for the initial construction, operation and maintenance of the Richardson Highway, which remains an important link in the state's road system. In addition, the university and Pioneer Home systems were expanded, and appropriations were initiated for public school student transportation. The Territory maintained strong ties to many of its frontier-era ways, depending heavily on fishing, hunting, mining and other natural resources; however, the move toward more intensive management of these resources is evident in, for example, legislation placing bounties on predators such as wolves, coyotes and fur seals. The importance of fish and game harvest to Alaskans was reflected in the Legislature's appropriation of $165,000 for controlling predators - this at a time when the Attorney General and Executive Branch department heads earned $5,000 annually. Resolutions were made to Congress pressing for greater control over land use and opposing wilderness and national forest designations - themes that would persist well into the future. In addition to seeking greater control of resources, the Legislature implemented or increased the regulatory regimes typical of mature democracies. Professional licensing and related oversight bodies were established; prohibitions on price-fixing and monopolies were put in place; worker protections such as unemployment compensation and worker's compensation insurance were enacted, and minimum wages for teachers ($1,800 to $2,100 per year, depending on location) and women ($18 for a 48-hour week, or $0.45 per hour for part-time) were created. Providence Hospital opens in Anchorage. The Spanish Civil War comes to an end. Franklin D. Roosevelt is reelected to a historic third term as U.S. President and Winston Churchill becomes Prime Minister of Great Britain. Nazi Germany and the Soviet Union sign a non-aggression pact. The Nazis invade Poland, France, the Netherlands, Denmark and Norway. Great Britain and France declare war on Germany and the Battle of Britain ensues wherein some 500 sorties by Nazi bombers are launched. Germany, Italy and Japan sign the Tripartite Pact; Italy invades Albania and Egypt, and declares war on France and Great Britain.